The Church of Santa Maria dello Spasimo is located in the Kalsa, one of the oldest parts of the city of Palermo. Around 1506 the jurist James Palermo Basilicò, particularly devoted to "Our Lady who suffers before Christ on the cross," gave fathers to Monte Oliveto possessions and earth to build a church and a convent. The Works began in 1509, but were never completed, and a few years later, because of the threat of Turkish invasion, structural changes were made to improve the defense system of the city. New city walls were erected around the church, and in 1537 a dug was built just where would instead be the convent. 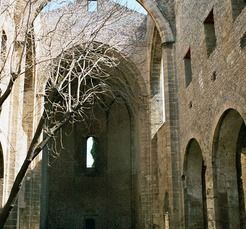 In 1569 the Senate of Palermo bought the complex for the military and the monks transfered their site in other places. In 1520 the building was of great importance at that time for the community of Palermo, so was enriched with a masterpiece of inestimable value, Lo Spasimo di Sicilia, painted by Raffello Sanzio, depicting the dismay of Mary before Christ collapsed because of weight of the cross. After the transfer of the monks, the structure fell into disuse and so the viceroy of Palermo Don Ferdinando D'Ayala gave it to Philip V, King of Spain in order to receive favors and benefits. The painting remained in Spain and is now preserved in the Museo del Prado in Madrid. In Catania, in the church of San Francesco Immaculate, there is one good copy, made on board in 1541 by Jacopo Vignerio. In 1582 the church was used as a location for public performances, but in the century after , the plague epidemic let it be necessary to use as a hospital for sick people. 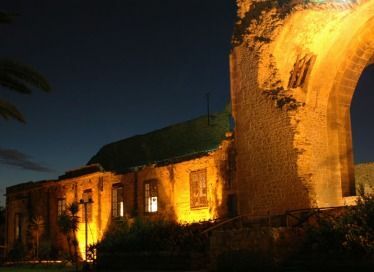 After the outbreak, the rooms were intended to be used as a granary and warehouses. In the middle of the eighteenth century the ceiling of the navy collapsed, and it was never rebuilt. From 1855 to 1985, the building was turned into a poorhouse and hospital, but the architecture was mostly changed to be able to get the rooms for sick people. After II World War, the site was reduced in landfills, and only in 1985, the works began to recover the dilapidated structures. Today the Church of Santa Maria dello Spasimo, is a multipurpose space, hosts cultural events, theater and music, and since 1995 has been scheduled to open even at night. Visit the Church of Santa Maria dello Spasimo Palermo.